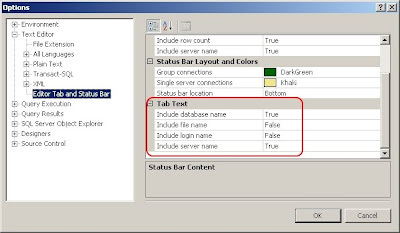 Another frequent complaint from users moving to the SQL 2008 Management Studio is that the text on the tabs now shows the filename rather than the server and database. Don't panic! This can be changed back!! 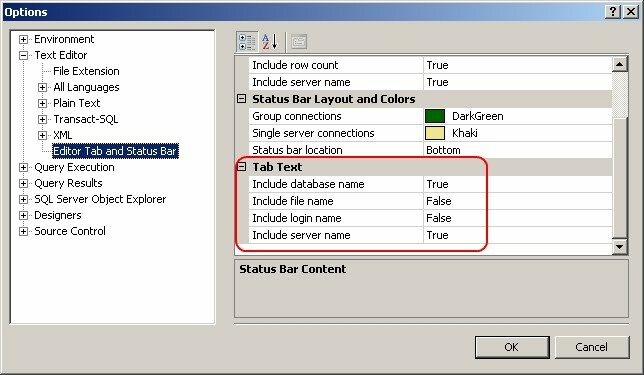 Simply select the Tools menu, and select "Options..."
Now in the left pane expand the "Text Editor" and select "Editor Tab and Status Bar". Finally scroll the right pane down to the bottom so you can see the "Tab Text" heading, and under that you can select what you want included on the tabs.